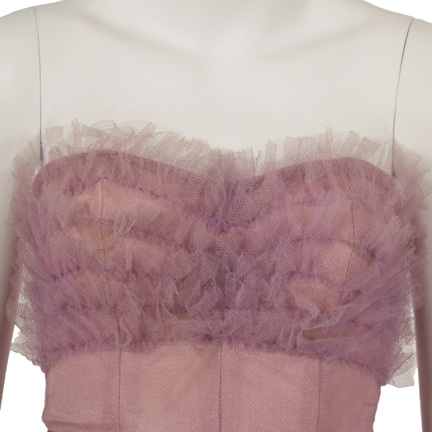 This dress was worn by the character “Veronica ‘Ronnie’ Miller” portrayed by singer/actress Miley Cyrus in the 2010 motion picture “The Last Song”. 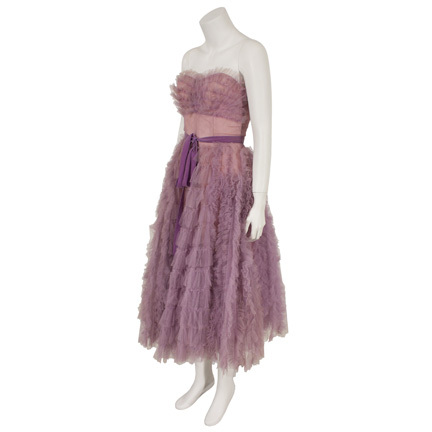 The vintage calf-length dress with a full skirt is constructed of pink taffeta covered with light purple tulle ruffles, and a purple velvet ribbon belt. The dress first appears notably in the scene where Ronnie and her younger brother Jonah (Bobby Coleman) go shopping to find a dress to wear to the wedding she plans on attending with Will Blakelee (Liam Hemsworth). After several unsuccessful tries, Jonah pulls this exact dress from off of the racks and she decides to purchase it. Ronnie then wore the dress throughout following day and evening when she attends the wedding, witnesses the hatching of the sea turtles she’s been protecting, and later at the hospital after her father unexpectedly collapses on the beach. Apart from this rare dramatic role for the actress, the “The Last Song” also featured standout performances by Greg Kinnear and Liam Hemsworth and the film won two Teen Choice Awards in 2010.